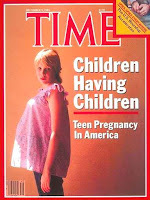 Teen pregnancy has become very popular in the United States. 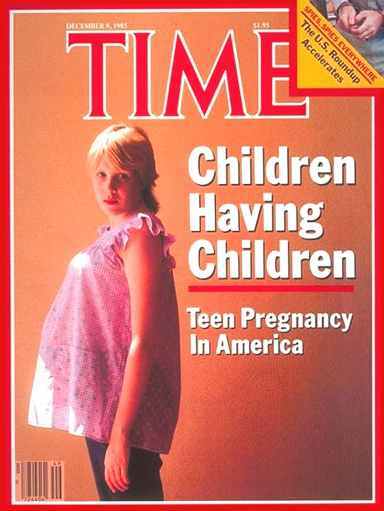 There is an estimate of one million teen pregnancies in the U.S alone. This is a hige statistic that just keeps climbing higher, and higher. About 85% of these pregnancies are unplanned, and that just leads to neglect, and abortion. There is help for pregnant teens that some people just don't understand. There are more risks to the baby being more to teen moms. They are more likely to experience health, social and emotional problems. Teen moms that give birth are more likely to deliver premature birth babies, and have complications. Teen mothers are less likely to gain an adequate amount of weight, resulting in a low birth rate for the baby. 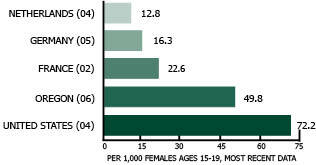 As the children born to teen mothers grow, they tend to have poorer health than that of children born to adult mothers. 60% of children born to adult mothers were said to have "excellent" health, compared to 38% for children born to teen moms. High teen birth rates are an important concern because teen mothers and their babies face increased risks to their health, and their opportunities to build a future are diminished. Babies born to teen mothers are more likely to die in their first year of life, compared to that of babies born to adult women. Teenage bith rates rose in 2007 for the second year in a row. The teen bith rates in the U.S exceed any other country. Over 10% of births in 2006 were to teenage mothers. Statistics show that 3 in 10 teen girls become pregnant before the age of 20. About 1 in 4 teens have a second baby within two years of the birth of their first. Teenage preganancy is becoming a huge issue, and the statistics keep increasing. It has become so popular in the United States that they now have two shows about it. 16 & Pregnant and Teen Mom. Even though both of these shows show the complications with having a baby at such a youg age, if the studies wern't as high of teen pregancy in the first place then their would be no need for these shows to begin with. # How did the essay change your views about the topic? i knew almost all of what was in this essay but if i wasn't aware about any of it, this would help me understand very well. I think u get an A+! A lot better then mine.